The 20th century saw the tango develop from a basic dance-form into a complex musical genre which was not necessarily a dance, but throughout there were the same combinations of energy, rhythm and melody, transformed into something which is darkly emotional, sensual and poetic. 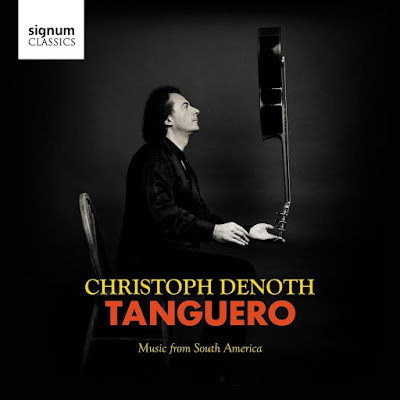 On this disc Denoth applies another layer by viewing the music through his own guitar tradition, which prizes beauty of tone and complexity of texture. Denoth does not try to be an Argentinian tango player, instead he explores the music refracted through his own technique. So we have complex and elegant variations, and a willingness to replace raw energy with something else, a powerful technique, sense of control of detail and an intricate texture based not on energy, melody and rhythm but on the harmonies created by multiple fingers on a guitar, not strumming but picking out individual notes and lines. The result is perhaps surprising, showing how music can be transformed yet still be the same. These arrangements are elegant and stylish, always engaging and melodic. Yet they also give us a picture of the tango. Perhaps the raw energy is lacking, but there are all sorts of other gains and throughout the imagination and intensity of the original music shines. How can it not, these are simply wonderful tunes and Denoth is following in a strong tradition, taking popular and folk music and re-inventing it in classical form. The disc includes an essay by Denoth on his inspiration for the disc, and also a long article by Graham Wade which introduces all the composers, many of whom will be new names though you may recognise their music. And a word about the picture on the disc's cover; no trick photography was involved, Christoph Denoth has been able to balance his guitar in such fashion since he was a youth!